PM got much brickbat from that statement recently. 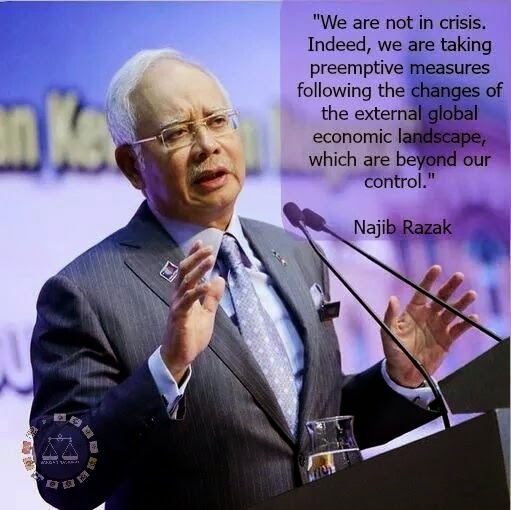 Right now, Pakatan leaders and supporters are spreading propaganda to say that Malaysia will soon experience severe economic crisis. Yes, there are challenges due to falling oil prices but this is currently a BUDGET CHALLENGE and not a ECONOMIC CRISIS. Was reading the paper and social media all morning. It may have a happy or unhappy ending, but something noticeable was how easy issues can get loss in translation by the wrong statement or misleading reporting. 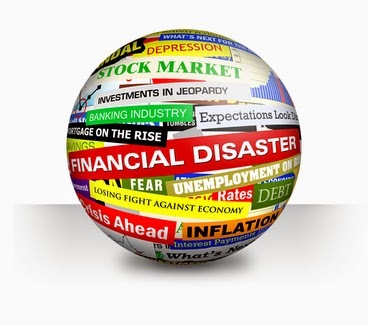 The blame can be leveled on the person making the statement or the communication support but at the end of the day, the public are also too gullible to miss the real message and easily diverted by headlines and discussion. The above picture is a classsic. The Minister, her supporter, communication unit and public missed the whole point of the issue. In this one, it has a happy ending. That title should come with a question mark but it seems that putting a title with a question mark is not good journalism. Ah well ... we are not journalist and for once, let's try put up a poser without a question mark. Defense Minister, Dato Hishamuddin Hussein Onn was in Kota Kinabalu yesterday to complete his 3 day tour. 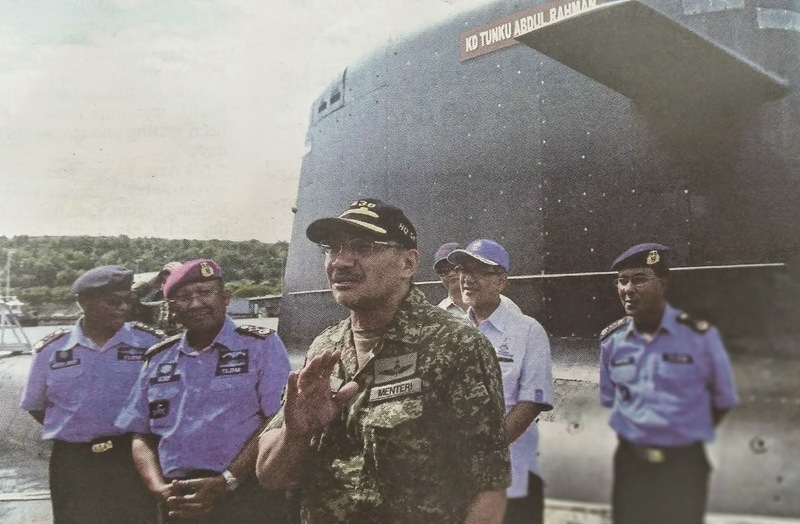 He visited the Royal Malaysian Navy base in Telok Sepanggar and was given coverage by NST today in page 10. The top page news would only be of interest to those avid military buff but the one below is a political puller. 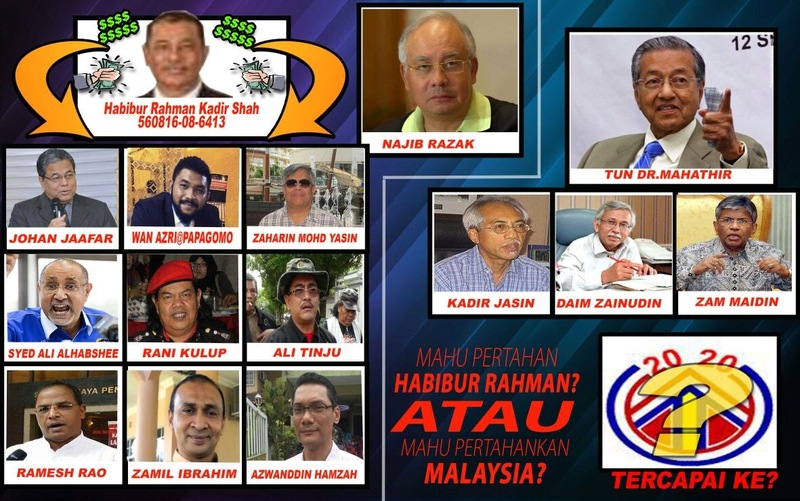 Was the attack on Tun Daim for real? The big political story this week must be TV3 giving repeated coverage to PKR leaders' comments on past investigations of corruption on Tun Daim. These were cases, which the predecessor organisation to MACC, Anti Corruption Agency (ACA or or the Malay acronym, BPR), had announced as no case in 1998. That is more than 15 years ago. It was puzzling why TV3 had to give them the mileage. That set-up a major buzz in the social media and raised quite an uproar among UMNO grassroots. 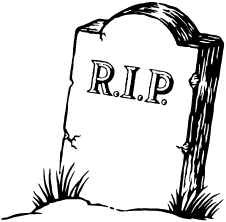 Ever since, there have been a ceasefire as claimed by the blog Life of Annie here. TV3 has stopped the attack. Social media believed the instruction to attack may have come from one Dato Habibur Rahman. However, many questions remain unanswered. Why and what the attack is all about? China 1 + 1 + 1 equals? Whenever something is so simple to deduce and easy to be agreeable to, they would say 1 plus 1 equals 2. In the world of M&A, they are always looking for that strategic fit that will see a 1 plus 1 equals 3 performance benefit. A better one, the binary numerical system which is the basic algorithm in electronics and information technology, 1 plus 1 equals 10. Only thing is a binary 10 is only 2. On our way on Putra commuter train to an evening appointment, we were reading today's The Star. Something interesting observed with respect to various matters related to China. 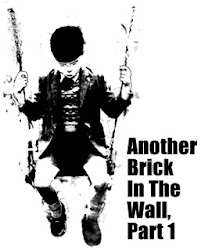 So what will 1 plus 1 plus 1 equal to? Hold out on politics and the internal squabbles first. Maybe later late afternoon, if we are in the mood..More important, the economy first. And it is about the revised budget to meet the lower oil and ringgit senario. Just proves critics that PM and government do monitor the situation. This is a government that has attained some level of maturity after coming to 60 years of independence. How could anyone even think the government is not aware of happening in market and preparing a plan? "Accused conspirator" Hardev Kaur monitors market and economic indicators around the clock and around the world. How she could be a political conspirator is puzzling? Lets not worsen things with politics and inner squables. It may not be about Tun Daim or Tun Dr Mahathir. 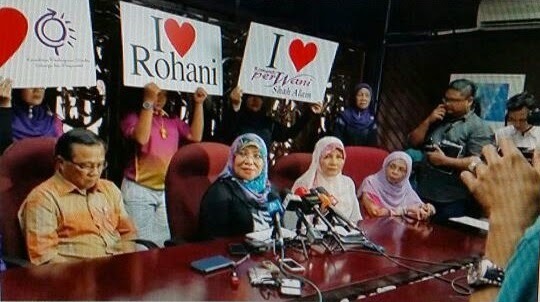 May not be them versus Dato Najib. Neither is it about some "Hantu Raya" or TV3. Nor about the grab for contracts. So who is it? What is it about? "Follow me, lead me, or get the hell out of way." In the military, one take order or give order and there is no other way. Every order or procedure should be adhered to. No question ask. Military expect discipline on all under command. There is no room to loosen on discipline. Discipline is everything and the chain of command have no leeway for dissent. Not even saying what is right. That is democrasy in public life. The military is to defend and preserve our democrasy, but it does not operate on democratic principle. Or, it will put the military organisation in disarray. 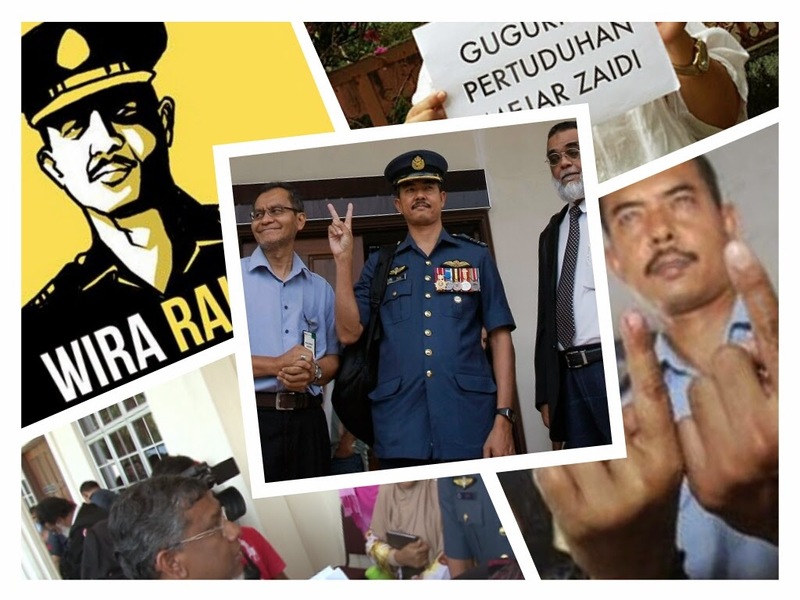 PAS supporting former Major Zaidi Ahmad was dismissed by the millitary court. Although what he said maybe politically relevant in civilian life, he had breached military order. Thus, attempt by Bersih 2.0 to politicise his dismissal by the military court is irresponsible. One reason there is no sense of honour and gentlemenly conduct in Malaysian politics is that political competitors, be they inside or outside a political party, could seized on opportunity from a troubled situation. 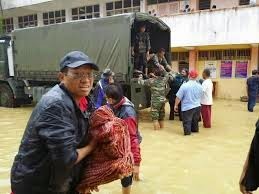 That happened during the flood disaster and it happened to Dato Dr Zahid Hamidi. 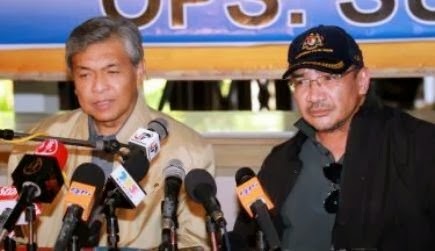 Instead of getting team support from his fellow cabinet member and/or UMNO party leaders, a reliable source claimed a group of instigators approach those close to Dato Hishamuddin Tun Hussein Onn to launch an attack on Zahid. The instigators gathered up MPs and Division leaders from a certain state to meet Hishamuddin and a suggestion to hit out at Zahid cropped up. Unfortunately, several attendees claimed the same set of instigators organised a similar gathering with Zahid to start a retaliation. Sounds like Lord Rothchild funding and selling arms to both sides in the Battle of Waterloo while also making money in the London stock market. In case anyone not know, it was similar type of instigators that caused the rift between Dato Seri Anwar Ibrahim and Tan Sri Khalid Ibrahim, which resulted in a long drawn leadership crisis in Selangor. Received the above image in our Whats App this morning. Someone made an image of the quote from our architect friend in yesterday's posting. The French translation for "I am not Charlie" came from our French educated youngest brother, which became this posting title. 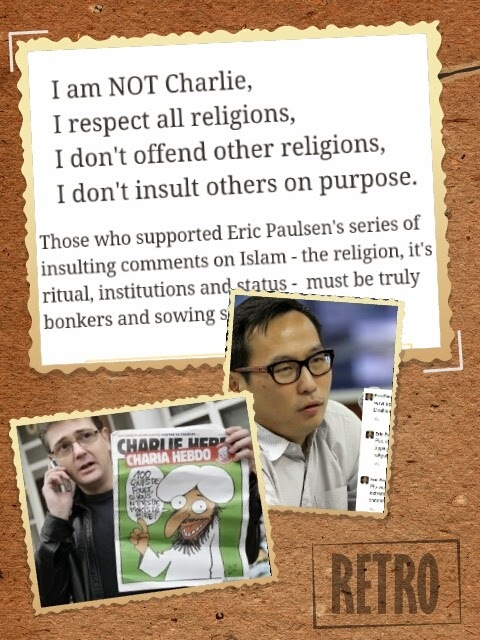 Condemn, YES but NOT Charlie! The reported 200,000 rally may had an emotional impact on the French. They strongly uphold to such rights and freedom of speech, expression and thoughts even how improper and vulgar the message be [read here in MI]. Away from the emotional out pour in France, common sense still prevail. MCA and Dato Ti Lian Ker must have gone bonkers for trying to nitpick issue out of Ibrahim's statement to call for his arrest. Generally most people, even Dato Ibrahim Ali, do not condone such violence, but one can hear the idiom "You reap what you sow" widely quoted. Can Halim Shafie tighten MCMC's enforcement role? For quite sometime MCMC Chairman, Dato Sharil Tarmizi had been receiving the brunt of the blame for the slow action on rouge social media users. 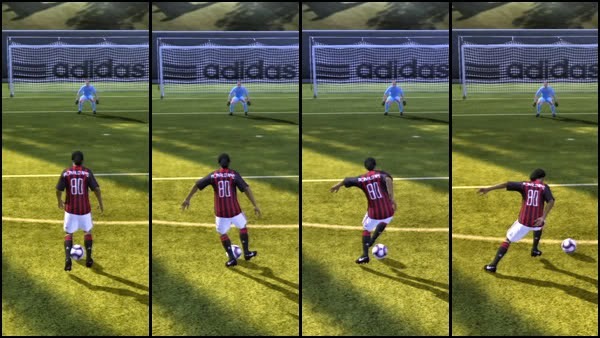 The complain then was that he was slow in taking action or did not take any action. It had come to a point where it was perceived that the authoritiees was quick to take action with pro-UMNO bloggers but slow when it comes to pro-opposition bloggers. Communication and Multimedia Minister has just announced the outgoing Telekom Malaysia Berhad Chairman and former MCMC Chairman, Dato Halim Shafiee to replace Sharil. At 65 years old and after retiring from several positions after retiring from Government, can Halim meet the expectation on the authorities? Perhaps, it is better that the enforcement role of the MCMC be assigned to the Police. Recently, there was a brief skirmish in our Whats App group on the Malay agenda. A dear log time friend, whose likely is fed-up with too much NATO on the subject of the Malay agenda, summarised his disgust by saying if Malays are still reliant on Chinese for goods and services, talk of Malay agenda to "perkasakan bangsa" is futile. There is truth to what he said but one cannot just sit back and let it come. Something must be done. Effort must be made within the community. Enough of government must do this and that. The activist must not hope on others or bureaucrasy to do it for them. As someone trained in Engineering and is in an operational corporate position, doers are naturally disgusted with polemics and rhetorics. But, the big picture macro discussion is necessary. 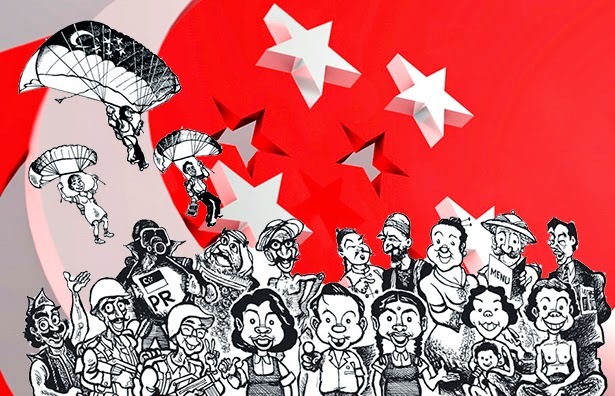 The Malays' problems are so deeply imbedded in their psyche as a result of their socio-political history that looking at it strictly from a retail economic delivery system suffers from myopia. To expect the creation of Malay businessmen as the yardstick of community development, it is a delusion. 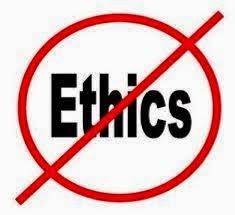 Malaysian businessman generally do not abide to any form of rules and ethics. They are self serving and that attitude is translated in their open confession of being bottom line driven, penny pinching obsession, and end justify the means moral platform. Our late lunch ... the ubiquitous mee goreng mamak and topped with a little bit of kuah rojak mamak. These are Indian Muslim dishes that one will not find in India. These mamak are so agile and adaptable that they adopt the local food as their own. To attract Malay and Chinese customers to their shop, they serve their version of the popular Malay and Chinese food and at the same time their Indian food. The same reason one see Tom Yam, simple Malaysian steak and chicken shop, etc served at mamak shop today. The Jawa in Malaysia have dishes like Mee Bandung, and Mee Jawa but such dishes cannot be found in Bandung or the whole Java island too. 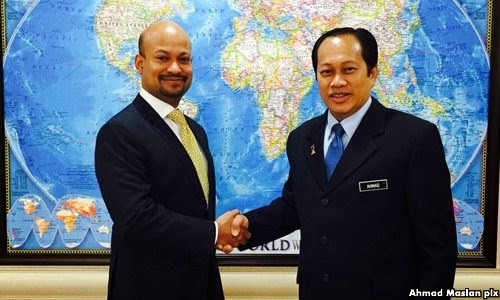 If Deputy Finance Minister, Dato Ahmad Maslan not say that the new CEO for 1MDB, Arul Kanda s/o Kandasamy converted to Islam, no one would have known. Not that it matters, but such a name would not have hinted that he is an Indian Muslim. Does he fulfill the definition of a Mamak? Anyway, his religion is hardly the issue. 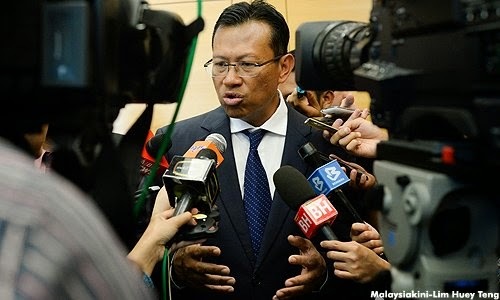 Despite Malaysiakini criticism of Ahmad [read here], give him a break. Arul's impressive resume in Islamic banking would have attracted such enquiry [see here in The Star]. On his second day in office, Arul had given The Star an interview. Considering how secretive 1MDB management had been and their reluctance to engage media, alternative and mainstream, that is a start. 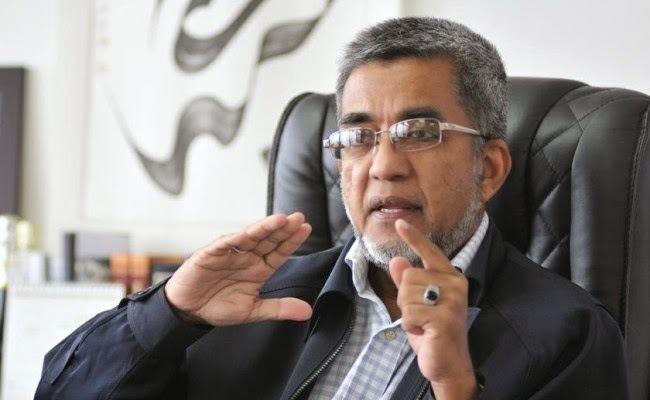 Roketkini reported Dato Abdul Malik Kassim, the Penang exco member in-charge of Islamic matters for the state saying the state government plan to audit the Zakat Pulau Pinang, the body for adminstering zakat for the state. Although DAP's SEACAT program in Selangor and Penang suffered the perception of being used to justify Pakatan Rakyat's state leaders wrongdoings and to ban BN state assemblymen, for the sake of CAT (Competency, Accountability and Transparency), why not? Zakat is administered by government servants, thus open to buruecratic inefficieny and abuse. However, Malik Kassim, whose nicname as told by a former PKR MP from Penang is Malek Itek, maybe stepping on some explosive mine with the statement. In his first term as exco member, he had been quacking strange statements. That time it was excusable, he was new. Lack of protocol or no manners? If yesterday's posting was about the alleged questionable integrity of a senior government official, tonight's posting is about the most senior government official, i.e. Tan Sri Dr Ali Hamsa, the Chief Secretary to the Government (or the Malay acronym KSN). Just received the story this evening. 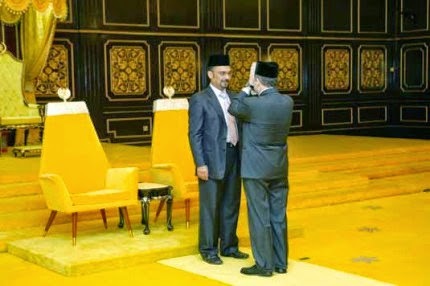 It is with regard to the swearing in of a Tuan Yang Terutama (TYT) as the head of a state. No details on the state, the name of the head of state and when it happened will be mentioned. Too embarassing to know the KSN has no common sense of protocol. Protocol is both "the forms of ceremony and etiquette observed by diplomats and heads of state" and "a code of correct conduct." It is also the way a certain tradition translate the proper manner to carry oneself for certain occasion. After being in the civil service for so long and having moved high up in the ladder, does the KSN still not understand protocol or just do not have manners? In the thick of the flood tragedy in the east coat, Member of Parliament for Kemaman and Minister of Communication and Multimedia (KKMM), Dato Seri Ahmad Shabery Cheek stands out in the forefront to visit and help the flood victims. It was not merely for photo-op but a honest display of sincerity. Shabery made his political debut through opposition politics via Parti Melayu Semangat 46. Since joining UMNO and Barisan Nasional, his political career had never been tarnished by any controversies or rumours of corruption. He leads a modest life without any luxury trappings. It would be a pity to see his good name smeared by his latest appointee for Commissioner of MCMC.